Even with no new introductions, the number of biological invasions in South Africa will increase as introduced species naturalise and become invasive. As of 2010 South Africa had ~8750 introduced plant taxa, 660 recorded as naturalised, 198 included in invasive species legislation, but only 64 subject to regular control (i.e. only widespread invaders are managed post-border). 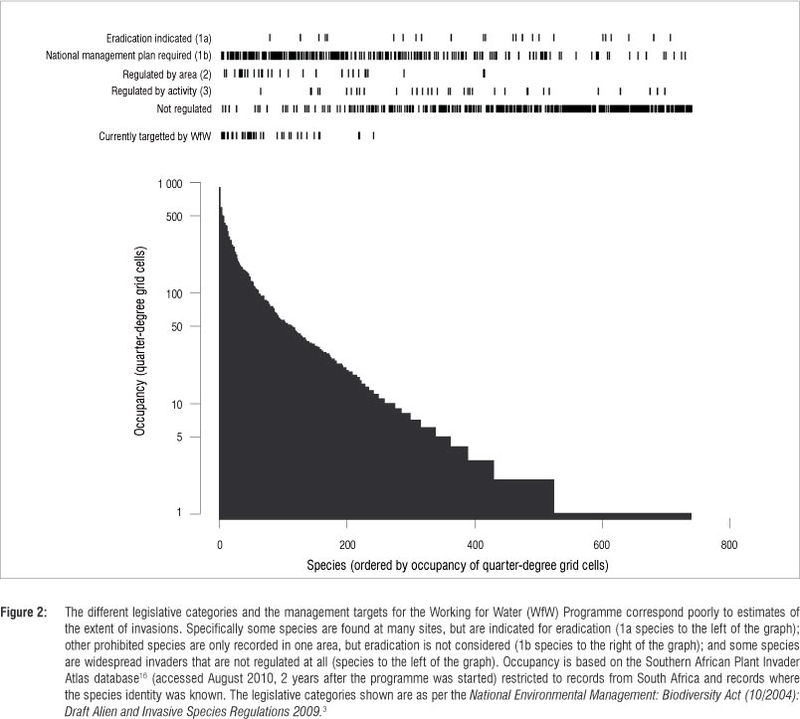 There is only one documented example of a successful eradication programme in continental South Africa - against the Mediterranean snail (Otala punctata) in Cape Town. Here we describe the establishment in 2008 of a unit funded by the Working for Water Programme as part of the South African National Biodiversity Institute's Invasive Species Programme (SANBI ISP) designed to (1) detect and document new invasions, (2) provide reliable and transparent post-border risk assessments and (3) provide the cross-institutional coordination needed to successfully implement national eradication plans. As of the end of 2012, the ISP had an annual budget of R36 million, employed 33 staff working across all nine provinces, supported 10 postgraduate students, hosted 35 interns (including those as part of a drive to collect DNA barcodes for all invasive taxa) and created over 50 000 days of work as part of government poverty alleviation programmes. The unit has worked towards full risk assessments for 39 plant taxa and has developed eradication plans for seven species; the unit is now helping implement these plans. By focusing on science-based management and policy, we argue that SANBI ISP can play a leading role in preventing introduced species from becoming widespread invaders. For plants, around 64 taxa are subject to regular control by the WfW programme, but 198 plant taxa are listed as invasive aliens17 and 238 are listed under draft regulations.3 So about 140 species are already defined as invaders where more control effort is required. As of August 2010, the Southern African Plant Invaders Atlas (SAPIA) documented 660 plant taxa as having at least naturalised in the region.16 So more than 400 species have been flagged as naturalised or invasive but are not listed in regulations, although more than half of these are recorded from one or two quarter-degree grid cells only (Figure 2). Finally, the total number of introduced plant taxa in South Africa is estimated at 750 non-native tree species and 8000 non-native shrubby and herbaceous species, many of which could naturalise in the future.18 The dedication- of specific resources to provide comprehensive risk assessments and control for these taxa has, until recently, been lacking (Figure 1). In this paper we introduce a new programme in the context of past approaches to detect, evaluate and eradicate invasive organisms. Finally, we discuss lessons learned and progress made to date. In March 2008 the South African National Biodiversity Institute (SANBI) was contracted by the WfW Programme of the Department of Water Affairs and Forestry to develop, in partnership with other stakeholders, a programme focusing on 'emerging' plant invaders. In the initial 3-year funding cycle the programme was called the Early Detection and Rapid Response (EDRR) Programme for Invasive Alien Plants. During the development of the programme, the terms 'emerging' and 'early detection and rapid response' caused considerable confusion among key stakeholders. For example, it was not clear whether EDRR should work on regional priorities (e.g. controlling species that are new- to a particular area but already widespread elsewhere in the country4). As a result, EDRR was initially tasked with assessing the feasibil ity of containment. However, it quickly became clear that responding to stakeholder concerns and working on large-scale containment exercises would use the majority of the resources allocated to EDRR, such that the management goal of eradication would again be sidelined (compare Box 1 and Box 2). The programme needed to focus on achieving this specific management goal, whereas the term 'EDRR' is a management approach that can apply to any stage of the invasion process at any spatial scale. The programme therefore dropped the name EDRR in favour of SANBI Invasive Species Programme (SANBI ISP). SANBI ISP has grown steadily and by the end of 2012 had an annual budget of R36 million with a presence in all nine provinces. SANBI ISP now employs 33 staff, has supported 10 postgraduate students, hosted 35 interns, and created over 50 000 person days, of which the majority were employed through the Natural Resource Management Programme poverty alleviation programme. A detailed assessment and survey of the population in 2008 found more than ten thousand plants spread over ~295 ha with plants forming dense monospecific thickets in patches.55 Fortunately, this was the only known population in the country, plants had not spread far from the initial point of introduction, and the seedbank was confined almost exclusively to below the canopy. Modelling work and field observations suggested, however, that if left unmanaged the species could expand substantially in range and impact the environment in ways similar to other Australian acacias.55,61 This work demonstrated both that the species posed a substantial threat, and that eradication was feasible (Figure 3). Without a specific focus on eradication, A. paradoxa would have continued to slowly spread through the park (and possibly further afield). However, it is likely that eradication will now be achieved as the necessary resources are in place and there is willingness from all parties involved.41 The main question remaining is whether our persistence lasts longer than the seedbank, but given the status of Table Mountain as a World Heritage Site, control should continue in perpetuity. Alien plant clearing operations in South Africa have largely been area-based,4 and, with the exception of classical biological control,71 there are few species-specific control programmes or national management plans, such as the Australian Weeds of National Significance initiative.72 In its initial phase, SANBI ISP was tasked with developing and implementing a national plan for a highly visible species that has been spreading rapidly from a localised source: pom-pom weed (Campuloclinium macrocephalum). Our remit was to manage outlying populations and work towards a national containment strategy for the species. Pom-pom weed is a South American asteraceous herb that was probably introduced into South Africa in the 1950s as a garden orna- mental. It was first recorded as a naturalised weed in the 1960s and was still at low levels well into the 1990s, but over the past 20 years it has spread throughout the grassland biome. Between 2008 and 2010, rapid response teams were contracted to clear all known populations during the flowering season (September-March) at a cost of over R5 million. While this endeavour created work for over 500 people during the flowering season, and reduced populations, there are no documented examples of medium-sized populations (>1 ha) having been extirpated, and, given the rise in sightings,73 it is clear that the species has continued to spread during this time. The pom-pom weed case is instructive for several reasons. Firstly, pom-pom weed could probably have been eradicated if action had been taken when it was first detected. Secondly, based on the difficulties of managing control teams across a wide area, a national management plan needs to involve local or regional early detection and rapid response teams that could quickly implement physical control of incipient outlying populations in combination with re-distributing effective biocontrol agents.74 But finally, pom-pom weed is a lesson for why eradication requires a national focus (Figure 2). 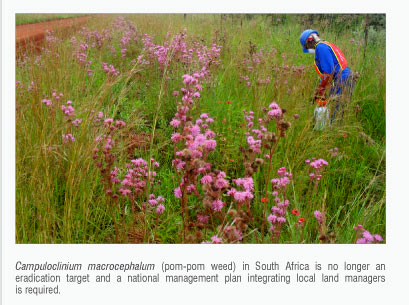 The budget spent on pom-pom weed clearing contracts alone was approximately 20% of the total programme's budget, with annual expenditure similar to that predicted for the eradication of other species (Table 1). The focus on pom-pom weed has meant fewer species have been evaluated or targeted for eradication. In conclusion, for South Africa to implement early detection and rapid response effectively there needs to be capacity and expertise at regional levels and species-specific national strategies with specific and measurable goals. There should also be structures in place to prevent such initiatives from detracting from eradication attempts. Ironically, the diversion of attention onto pom-pom weed might mean the next pom-pom weed can no longer be eradicated. In the rest of the paper we discuss progress on these three core areas of work. There are several strategic approaches for invasive alien species detection (e.g. site-specific surveys, species-specific surveys and random surveys20). For commercial agricultural pests in South Africa there has been both area-specific monitoring (e.g. field inspectors employed to survey farms for pests) and species-specific monitoring (e.g. approximately R2 million per annum is spent on detecting and controlling incursions of the fruit-fly Bactrocera invadens from neighbouring countries) (Venter JH 2011, personal communication, Nov 22). But most documented cases of naturalisation or invasion have come from a few interested scientists not employed specifically to look at the issue of invasions.8,21-24 For example, Giliomee23 documented a- rate of approximately one new insect establishing in South Africa per year over the past decade, while Herbert24 estimated that there has been one new introduced terrestrial mollusc establishing every 5 years (28 in total since the 1850s). A recent assessment of marine and estuarine biological introductions showed just how poor our overall knowledge of particular groups is. Through reviewing historical literature, and some limited additional focused survey work, Mead et al.22 quadrupled the number of known marine introductions to 86 and highlighted several cryptogenic species. In comparison, the naturalised plant flora is well known and documented thanks largely to Lesley Henderson and the SAPIA project.16 SAPIA was founded on general roadside surveys for invasive alien plants and has grown to be the primary repository for new plant naturalisation records. Detection efforts by SANBI ISP to date have largely been based on revisiting historical records in SAPIA, but site-specific (e.g. historical arboreta) and species-specific surveys (see Box 1 and Box 2) have been initiated. SAPIA itself has shifted emphasis, and is focusing more on new instances of naturalisation, linking directly with SANBI ISP. For example, 54 new species were recorded as naturalised between April 2010 and March 2013 (Henderson L 2011, unpublished SAPIA annual progress report, March, ibid 2012, ibid 2013). These records are highlighted through SAPIA's quarterly newsletters,25 increasing the potential to discover other naturalised populations of these species. 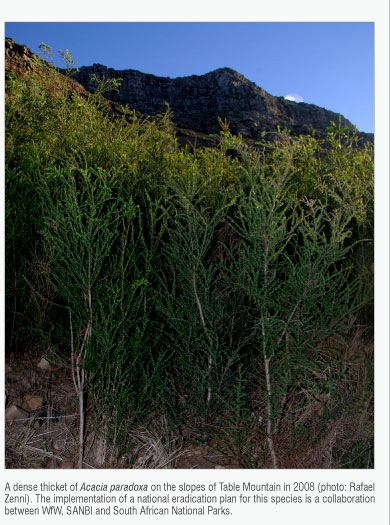 While the SAPIA database continues to provide significant value, SANBI ISP has also focused on improving identification and data management.29 Of the 198 species listed under the Conservation of Agricultural Resources Act, 2001 (CARA), as of 2009, 40 did not have herbarium records recorded in the Pretoria Herbarium Computerised Information System (PRECIS), either because specimens were not collected or data had not yet been uploaded. This omission can have direct costs for management. For example, the biological control of Cactaceae has historically been hampered by a lack of accurate taxonomic knowledge that has only been resolved more recently using phylogeographic tools.30 To address these concerns, three taxonomists and three taxonomy assistants have been employed, and resources provided for the additional 1386 herbarium samples collected to date. Moreover, the programme has been involved with a drive for the DNA barcoding of introduced taxa. This resulted in 23 postgraduate interns being employed for 6 months in 2011 and 2012 working around the country on different fauna and flora. After detection, the decision to prioritise resources and act against a species needs to be based on an evaluation of invasion risk. There are a variety of tools available for pre-border assessments,31 although arguably such assessments are no better than simply considering prior invasion history and the quality of climate match.32 Given the uncertainties inherent in the invasion process it has been suggested that risk assessments should become adaptive.32 Many introduced plants initially have significant value for particular stakeholders and costs are disparate, only accumulating later.4 Therefore the net value of an introduced taxon can change substantially over time.33 As such, post-border risk assessments should be done in consultation with relevant stakeholders. If legislative processes are cumbersome and a particular stakeholder is keen to engage, non-binding agreements can be useful in curbing the threat of invasions. For example, many members of the horticultural industry were involved in developing the St Louis Declaration of 200134 (see also Burt et al.35). Stakeholders can also be directly involved in the legislative process. For example, the horticultural industry in New Zealand is an active participant in the development and assessment of regulations as part of the National Pest Plant Accord.36 There is no such similar high-level legislative consultation in South Africa, but comment on proposed regulations is sought. WfW does, however, run a Nurseries Partnership Programme which, amongst other roles, aims to enhance the level of awareness within the nursery industry and the general public of invasive alien plants, their potential impacts and relevant current legislation. Legislation is a growing component of invasive species management internationally, with 55% of countries signatory to the 1992 Convention on Biological Diversity having invasive alien species relevant national legislation in 2010.37 Current South African legislation regarding invasive alien plants forms part of the Conservation of Agricultural Resources Act, 1983. Regulations 15 and 16 under this act, which concern problem plants, were amended in March 2001; while new regulations have been debated and published in draft,3 they have yet to be formally published and there are few legal measures in place for controlling problem species that have not previously been regulated under CARA. 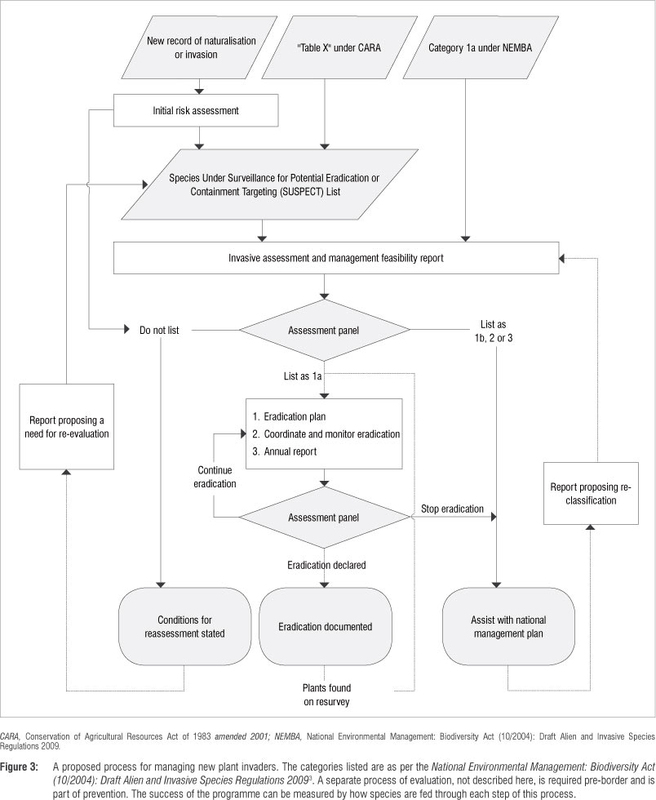 As part of CARA, the Agricultural Research Council - Plant Protection Research Institute developed a 12-criteria risk assessment flow diagram for evaluating plant species for regulation. However, the process has not to our knowledge been published and it relies heavily on the expertise of individual assessors, which means it is very difficult to justify the regulatory decisions. As a result, conflicts of interest have arisen when regulated species have an economic value. For example, Paulownia tomentosa shows signs of invasion, but a local lobby group has advocated the development of plantations of the species for the production of timber, biofuels and wood pellets for power generation. Consequently, the species was not listed on the CARA regulations but is included on the National Environmental Management: Biodiversity Act (10/2004): Draft Alien and Invasive Species Regulations, 2009 (NEMBA 2009 draft AIS regulations).3 Similarly, many species proposed under CARA were removed at a later stage. The act of 2001 lists 198 plant taxa, but a further 101 were included in an unofficial Table X. 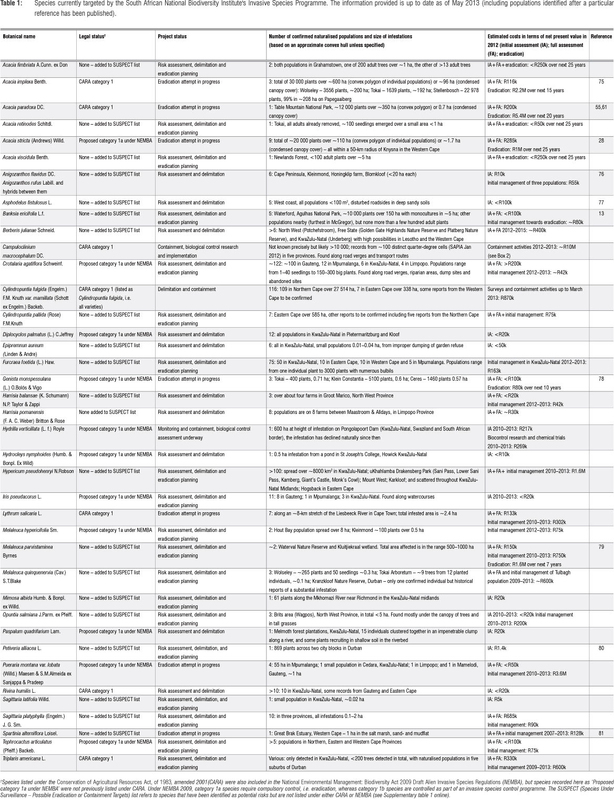 This table is a list of introduced taxa that posed an identified risk to South Africa's agriculture (or biodiversity), but that either had not been fully assessed or a decision had not been agreed upon by stakeholders. An ongoing concern is that taxa in Table X are not formally assessed, nor are the requirements to keep them on the list stipulated - in essence, the commercial exploitation of taxa in Table X is questioned without any supporting justification. The number of new naturalisations sensu Pysek et al.38 is, of course, not known, and will depend on the effectiveness of detection mechanisms and the number of species that are introduced. The second category is based on Table X under CARA. To provide some assurances for this list, we propose that all taxa on Table X be added to a new list: the 'Species Under Surveillance - Possible Eradication or Containment Targets' (SUSPECT) list. While the list will have no direct legal inference, it should include species where there is sufficient documented evidence to warrant in-depth investigation. We propose that new additions to the SUSPECT list (in particular new instances of naturalisation) must be accompanied by (1) an initial risk assessment as per article 21 of the NEMBA 2009 draft AIS regulations, (2) a specimen lodged in a South African collection, (3) a short background dossier on life-form and invasive tendencies elsewhere in the world lodged with SANBI and (4) a detailed project plan including information on current regional distribution in South Africa, local-scale distribution for one or more naturalised populations, an assessment of management options and an outline of proposed research. As per chapter 6 of the NEMBA 2009 draft AIS regulations, SANBI will then facilitate an invasive assessment and management feasibility report for each species on the SUSPECT list, and provide recommendations for how the species should be dealt with. These invasive assessment reports would then be assessed by an independent advisory panel, and would form part of the public consultation process. The third category is a legislative definition. The main problem here is that the NEMBA AIS listing process was not complete as of May 2013. Issues of overlap with CARA and the categories for listing had not been entirely resolved, but we strongly recommend that a category that explicitly calls for nationwide eradication should be included. Simberloff42 outlined five main features of successful eradications: (1) invasions are detected early, and there is little delay before action is taken, (2) sufficient resources are allocated from start to finish, (3) a person or agency has the authority to enforce cooperation, (4) enough research is conducted to identify when, where and how management will be most effective and (5) the project has an energetic, optimistic, and persistent leader. We know of several plant eradication attempts in South Africa, all initiated by the government, but none of which led to eradication. Intensive programmes were initiated in the early 1960s to remove camel thorn (Alhagi camelorum) from irrigation schemes. However, the systemic herbicides available at the time dealt poorly with the extensive underground root systems.43,44 Satansbos (Solanum elaeagnifolium) was first recorded in 1952,45 but only in 1968 was legislation enacted and an eradication programme initiated.46 Despite some local successes, by 1972 the eradication campaign was cancelled with the total infested area having reached an estimated 14 500 ha.47 This failure was ascribed to inadequate biological knowledge, ineffective herbicides and application techniques, and a lack of cooperation from many farmers.46 The most extensive eradication campaign in South Africa was against- jointed cactus (Opuntia aurantiaca).48 This plant was highlighted as a potential eradication target as early as 1892,49 but eradication attempts only started much later. Despite legislative backing (e.g. the Jointed Cactus Eradication Act of 1934), thousands of labourers and millions of rand spent on herbicides, apparently not a single farm was cleared.48 More recent efforts (since 1978) to eradicate Cylindropuntia fulgida have similarly failed, again probably because of a slow initial response, the lack of efficient follow-up, and ultimately inadequate funding (Zimmermann H 2011, personal communication, Oct 31). Eradication as a management goal for animal invasions has had somewhat of a resurgence recently. Indian house crows (Corvus splendens) are being targeted in Cape Town, eThekwini-Durban and Richard's Bay, rabbits (Oryctolagus cuniculus) are being removed from Robben Island (Western Cape), and feral pig (Sus scrofa) populations are being monitored in the Western Cape - although all of these projects are yet to fully determine whether eradication is likely to succeed. All these projects are striving to be transparent, humane and sensitive to public concerns - a lack of public acceptance for vertebrate control can stop an eradication programme. Despite the number of failures, there are arguably many instances of successful eradication which have not been properly documented: e.g. red-eared slider terrapins (Trachemys scripta elegans) in Cape Town,52 the decollate snail (Rumina decolata)24 and some invasions from forestry trial plantings.53 But these are likely interventions that occurred before the species was found at multiple sites or in large numbers. The first challenge faced by SANBI ISP was to demonstrate that eradication is achievable. We attempted to prioritise action based on various criteria (such as number of records in SAPIA and expert opinion). However, invasive taxa in South Africa studied in enough detail to facilitate prioritisation, were too widespread for eradication.57-59 Therefore, the programme took a pragmatic approach. We targeted species brought to our attention by field experts (e.g. Opuntia salmiana), where a project had already been initiated (e.g. Acacia paradoxa, Box 1), or where the plants were known to be major invaders elsewhere in the world (e.g. kudzu vine, Pueraria montana). Opuntia salmiana was first detected in 1988 by a Department of Agriculture weed extension officer who recognised the threat of another cactus invasion, and initiated an eradication programme (Farrell E 1989, Department of Agriculture, Land Use and Soil Management unpublished- report, May). A lack of resources, and the retirement of the champion, meant the project was shelved. Thankfully, while the infestation has become denser in the two decades since the last eradication attempt, it is confined to two properties so eradication might still be feasible. Pueraria montana (kudzu vine), was first recorded as invasive in the 1960s by government foresters. As kudzu vine is one of the most widespread and persistent invaders in the USA, probably in part because plants were originally widely redistributed for erosion control and as fodder supplements,60 the Department of Forestry was concerned enough to invest in an eradication programme. Substantial efforts were made to control the species during the 1970s and early 1980s, but the project ultimately failed (Zimmermann H 2011, personal communication, Oct 31), again because of a lack of persistence in terms of effort and funding, and continuity (in this case the land was taken over by private forestry companies). Recent surveys suggest the original infestations are still present and have not dramatically increased in area. While several additional populations have been identified at different sites around the country, eradication is therefore still probably economically viable. Finally, both for determining eradication cost-effectiveness and prioritising between eradication targets, the benefits to be gained through control need to be included. For example, A. paradoxa is invading and outcompeting natural vegetation on a World Heritage Site and so has by far the highest current biodiversity impact of any of the wattles assessed for eradication to date, although the population is relatively small and will be costly to manage. Invasive taxa in South Africa are usually only managed once they are widespread. Incursions are detected too late, there is a substantial delay between the perception of a problem and both on-ground management and legislative change and eradication is not carried through to completion because of poor planning. 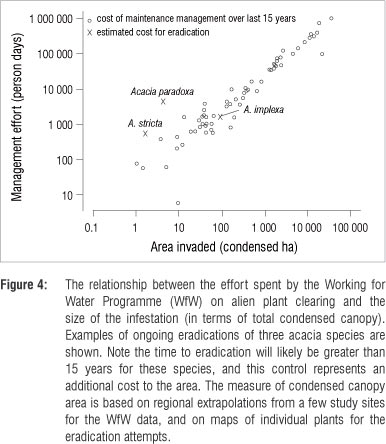 Initial estimates of eradication costs relative to standard WfW operations vary markedly. It is costly to remove low density infestations that are hard to detect in areas with poor accessibility, but, in some cases, with greater precision and coordination, eradication need not be much more expensive than standard clearing. As for species of conservation concern,65 listing invasive species can have significant political and economic consequences, so risk assessments need to be transparent and evidence based (e.g. combining field data observations, research on species attributes and relevant literature; Figure 3). Data therefore needs to be stored in a way that can be used for legal cases when necessary. Any such data and decisions should be documented and published, and the decisions implemented. Given that legislation should link to management goals, such risk assessments will also need to consider on-ground management (e.g. eradication feasibility, Box 1). For these reasons, SANBI ISP was set up to improve detection rates, perform post-border risk assessments and coordinate nationwide eradication attempts. Similar organisations have been proposed around the world (such as in Europe66), but we believe South Africa is the first country to have a unit specifically dedicated to these tasks. To date, full risk assessments are being developed for 39 species and eradication plans are being implemented against seven species (Table 1). But ultimately, the success of SANBI ISP depends on research, implementation, public engagement, and regulation being administered and conducted as a single iterative process. While such effort is difficult to coordinate67 and raises many issues (see Box 3), we believe that by combining adaptive management and applied research, it is possible to reduce the number of new naturalisations and invasions; we are confident that in this way we can reduce (South) Africa's invasion debt (sensu Essl et al.68). While progress has been achieved on a number of species (Table 1), the work to date has highlighted several key issues that need to be addressed. Here we outline a few of these with the aim of setting a preliminary research agenda (see also Panetta et al.59). • A transparent watch list should be developed so that processes can be implemented to prevent high-risk species from being introduced, and to quickly detect those that are introduced. • Information sources on species that are already in the country need to be assessed and collated to identify records that need verification and identify species that need further evaluation. • Sites where there is a high likelihood of naturalisation need to be identified so that monitoring can be targeted. • A process is needed to record, verify and act upon observations from the general and professional public to ensure observers feel valued and are more likely to submit records, thereby increasing the rates of detection. • Systems are required to identify unknown taxa more quickly to reduce reaction time. • It is often unclear whether a record is actually an alien. Standard processes are needed to resolve issues of origin (native or introduced), so that control and legislation can be implemented timeously. • Species identified as requiring evaluation or eradication need to be prioritised for detection across the country. • Standard metrics need to be set for reporting the abundance and extent of infestations. • Standard protocols are required for determining the area that needs to be searched and how populations should be delimited at a landscape scale. • Tools are required to estimate the rate of population growth and spread of newly introduced species in order to estimate the threat posed and where to search. • The abiotic or biotic factors limiting population size and spread rates should be identified if future risks are to be predicted and any lag phases should be identified and quantified. • A formalised process for assessing risk, which includes consultation with stakeholders, is needed. • The regulatory process for listing or changing the status of listed species needs to be made explicit and timeous. • Standard procedures are required to determine the relative invasiveness and stability of cultivars or hybrids in comparison to parental species, in particular to provide advice to horticulturalists. • Procedures are needed for determining the potential for and detection of hybridisation between introduced taxa and native taxa. • Standard metrics for measuring progress towards eradication, with procedures to collect and collate relevant field data, are needed. • A protocol is required to estimate the efficacy of management, specifically the rate of detection in relation to likelihood of reproduction between control operations. • The likely maximum propagule persistence should be estimated to determine the duration of control operations. • Standard procedures for estimating the time to eradication, which can be easily updated as new field observations are made, are needed. • A process is needed for determining the costs of different actions and thereby the benefits of opting for a strategy of eradication. • A strategy for deciding when to declare the eradication unsuccessful (and if so how the species will be controlled post-eradication attempt) should be determined early for each attempted eradication. • It should be specified and made clear that the government should take financial responsibility for eradication attempts. • A process for gaining access to private property, if it is required for eradication, needs to be set in place. • The efficacy (financial and likelihood of success) of different management approaches needs to be assessed. • A process is required to ensure herbicides are available timeously with due consideration for potential negative consequences. Similarly, a process is needed to ensure any animal eradication is conducted ethically. This work was funded by the South African Working for Water Programme of the Department of Environmental Affairs. J.R.U.W. acknowledges support from the DST-NRF Centre of Excellence for Invasion Biology. All current and past staff of SANBI ISP contributed valuable insights, discussion and enthusiasm. Sjirk Geerts, Di Spear and John Moore provided useful comments and Sjirk Geerts assisted with the analysis in Figure 4. All authors contributed to the conceptual development of the paper; J.R.U.W. led the writing. 8. Van Wilgen NJ, Wilson JRU, Elith J, Wintle BA, Richardson DM. Alien invaders and reptile traders: What drives the live animal trade in South Africa? Anim Conserv. 2010;13(S1):24-32. 16. Henderson L. Southern African plant invaders atlas (SAPIA). Appl Plant Sci. 1998;12:31-32. 36. Newfield MJ, Champion PD. Risk assessment for the New Zealand National Pest Plant Accord: Which species should be banned from sale? Plant Protection Q. 2010;25(2):75-78. 44. Jooste WJ. Experiments on the chemical control of Alhagicamelorum Fisch. S Afr J Agr Sci. 1965;8:287-288. 48. Moran VC, Annecke DP. Critical reviews of biological pest control in South Africa: 3. jointed cactus, Opuntia aurantiaca Lindley. J Entomol Soc S Afr. 1979;42(2):299-329. 49. Fischer A. New cactus (prickly pear). Agri J Cape of Good Hope. 1892;5:93-94. 51. Herbert DG, Sirgel WF. The recent introduction of two potentially pestiferous alien snails into South Africa and the outcomes of different pest management practices: An eradication and a colonization. S AfrJ Sci. 2001;97(7/8):301 -304. 59. Panetta FD, Csurhes S, Markula A, Hannan-Jones M. Predicting the cost of eradication for 41 Class 1 declared weeds in Queensland. Plant Protection Q. 2011;26(2):42-46. 62. Olckers T. Targeting emerging weeds for biological control in South Africa: The benefits of halting the spread of alien plants at an early stage of their invasion. S Afr J Sci. 2004;100(1):64-68. 71. Zimmermann HG, Moran VC, Hoffmann JH. 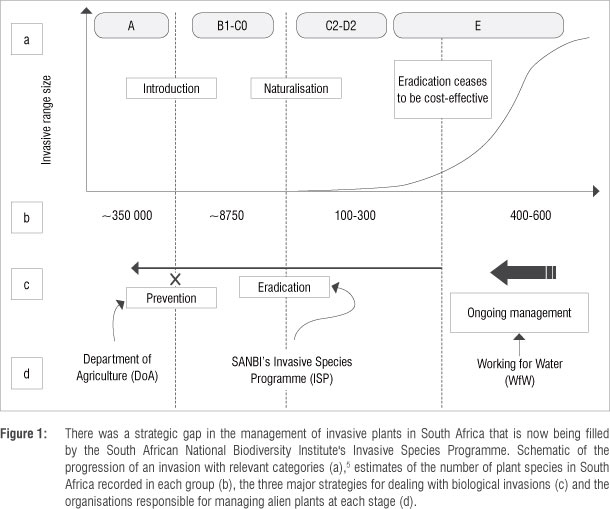 Biological control in the management of invasive alien plants in South Africa, and the role of the Working for Water programme. S Afr J Sci. 2004;100(1/2):34-40. 76. Le Roux JJ, Geerts S, Ivey P, Krausse S, Richardson DM, Suda J, et al.. Molecular systematics and ecology of invasive kangaroo paws in South Africa: Management implications for a horticulturally important genus. Biol Invasions. 2010;12:3989-4002. 80. Cheek MD. Naturalisation note: Petiveria alliacea L. in KwaZulu-Natal, South Africa. Bothalia. 2013;43(1):97-100.